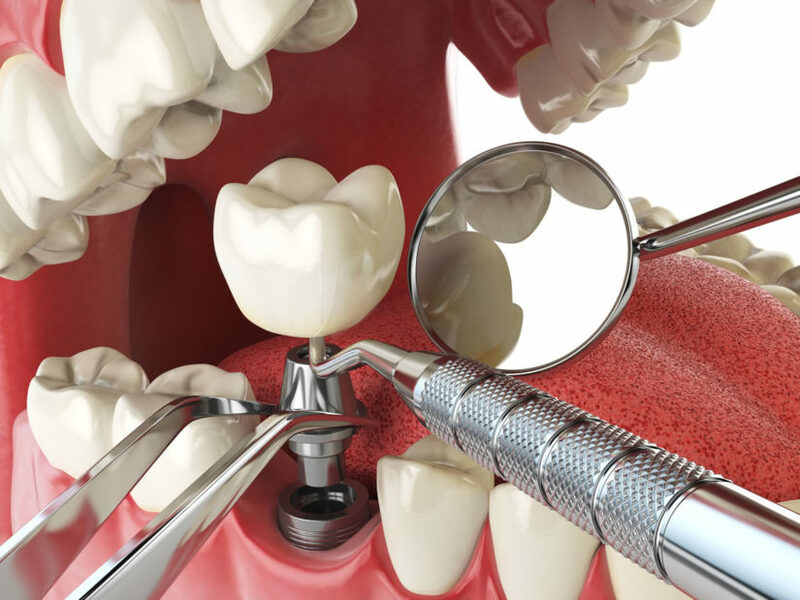 If you’re in need of a dental implant, you may not know exactly what to expect during the procedure. Your dentist or oral surgeon might throw around terms that sound like they’re speaking another language. This guide can help you decode dental speak and understand exactly what happens during a dental implant procedure. An abutment is a connector that your dentist will build into or attach to the top of your dental implant. This serves as the attachment for the replacement tooth, crown, or bridge, keeping it firmly in place. This term refers to the teeth that support a bridge or partial denture. The bridge is attached to the abutment tooth during a full crown prep or inlay/onlay preps. For a partial denture, clasps or rests are used to support the denture on the abutment tooth. Ceramic is a material used to make dental implants. This material is made of clay and hardened by heat before it’s placed in your mouth. Some people prefer the aesthetic appeal of ceramic to titanium since it offers a more natural look. It’s available in ivory so it looks similar to existing teeth and roots. Some ceramic implants have conical threading at the base for easier attachment to the bone in your jaw. You might also get a ceramic implant if you have an allergy to metal. A crown, also referred to as a cap, replaces a single tooth. If you have lost or broken a tooth due to infection, decay, injury, or other health problem, a dentist can fit your mouth with a crown to replace the missing or damaged tooth. Crowns typically fit over the top of existing teeth, although they must be ground down to fit, or attach to the abutment of a dental implant. Dentures are a traditional option that can replace missing teeth, but many patients don’t have the same success with dentures as they do with implants. Some dentures can be removed daily for cleaning and storage while others are attached permanently to the mouth, such as implant-supported dentures. Partial dentures replace at least one tooth but not the arch, and these can shift in your mouth and cause discomfort or make it more difficult to eat, talk, and smile. The endosteal implant is the most commonly used type of implant exercised in modern dentistry, according to the American Academy of Periodontology. In order to fit this style of implant, a dentist will place small screws, plates, blades, or cylinders directly into the jawbone through a surgical procedure. Each implant can hold at least one prosthetic tooth. An eposteal implant receives support by resting directly on the jawbone. This is not used as commonly by dentists today and is often seen as an outdated way of placing an implant. However, when the risk of advanced bone resorption is high in a patient, the dentist may opt for an eposteal implant. A dental implant, also called a fixture, is a medical device that interfaces with your jawbone to support a dental prosthesis, such as a bridge, crown, denture, or other facial prostheses. Through osseointegration, the implant will fuse securely to your bone, providing a strong and durable result that will last for years. Many dental implants last for patients’ entire lives, making them better options than bridges, which may require replacement, and dentures, which can be uncomfortable and difficult to wear. Osseointegration comes from Greek and Latin words meaning “bone” and “to make whole.” This biologic process allows a dental implant to fuse with your existing bone, improving the strength between the living bone and the load-bearing implant. A subperiosteal implant sits on top of the jaw with the posts of the metal framework protruding through the gum to hold the prosthetic tooth (or teeth) in place. If a patient has minimal bone height or is unable to wear conventional dentures, a dentist might use this method for attaching an implant. Most modern dental implants are made of titanium. This metal comes with a number of advantages. Few people are allergic to titanium, so it’s rare for a patient to have a reaction to this material. It’s also lightweight but very strong, reducing the weight on your bone or within your mouth. It has a high oxygen affinity, which means that it will form a thin oxide layer when placed in the body. Titanium can also ossify with bone, producing a stronger result that can last for many years. A small percentage of people do experience allergies to titanium, so zirconia is another option for the implant material. Zirconia implants have no prosthetic connections, so the risk of bacteria growth is lower. Patients may experience better gum health when they have this type of implant. It’s also white in color so it looks more like a natural tooth. If you still have questions about dental implants or terminology, talk to one of our experienced dentists to learn more. Here are all of our dental implant dentists.